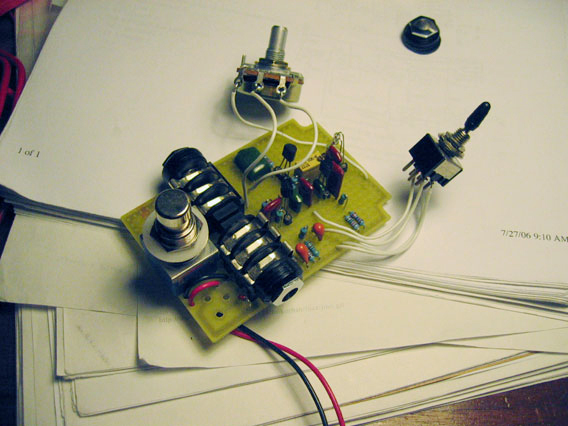 This is a Green Ringer with both the filter mod and nulling mod. I found these mods at General Guitar Gadgets. The filter mod filters the input signal to bring out a stronger octave. The nulling mod helps tune in the octave generated by balancing the signal on each half of the wave form. The filter mod is switchable. With the switch on the octave is very pronounced. With an almost cartoonish character. 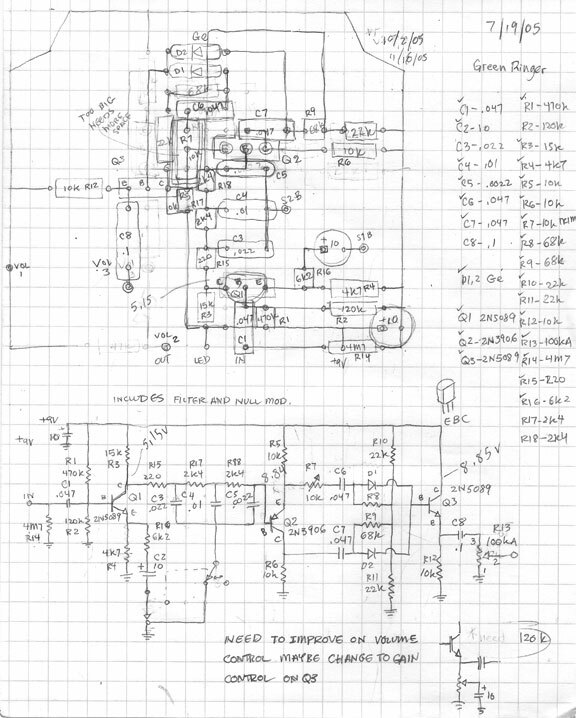 Here’s a drawing of the scehmatic that combines JC Maillet‘s nulling mod and Ben Milner‘s filter mod. I thought my Ampeg Scrambler mod was the livin’ end, octa-sound-wise….I separated out the “texture” octave knob, A/B ing it w a footswitch. Then, I tried the “Simple Octave Up” based around the Bobtavia – a VERY clean octave, & what stellar ringmodlike “boinks” it gives,when you just merely touch strings, esp.on low settings. It’s MUCH cleaner than Roger M’s Octavia ( I have 2 1980s opto switch ones)Great for super-clean octave OD. The real Thick Sizzler, tho, (for myself , anyway) turns out to be the Foxx Tone Machine. My Boscorelli DM I, II, & III goofed – my original printout was backwards, so the P’N’P pattern was as well…have’nt heard what their ( seemimgly extensive) parameter mixabilty can do yet. Can you specify how the DPDT switch is hooked up? I can’t figure it out. Thanks.